There probably exists no such chapter buried deep inside general manager Ben Cherington’s copy of The Red Sox Way: A Blueprint for Winning in the 21st Century entitled “Finish Last in the Division Every Other Year.” Yet that was Boston’s fate in both 2012 and 2014, two of the three years Cherington’s been at the helm. From 1998 through 2011 the Red Sox never won fewer than 82 games, a 14-year stretch that included two World Series championships, 10 second-place finishes in the AL East (damn Yankees) and a near annual late-season playoff push. Then, after a beer-and-chicken-fueled pennant race tailspin in 2011, a collapse which cost the Red Sox a playoff appearance, a sub-70 win (non-strike) season invaded Fenway Park in 2012 for the first time since — wait for it — 1965. The 2012 Red Sox featured an ugly combination of underperformance (specifically from the pitching staff), injuries, and a Bobby Valentine managerial experiment gone wrong. The starting rotation, which was supposed to be anchored by Jon Lester and Clay Buchholz, didn’t feature a single regular with an ERA+ better than average. The bullpen wasn’t much better, as far too many high-leverage innings went to the likes of Alfredo Aceves and Mark Melancon, a duo that combined for an ERA approaching six and allowed 19 home runs. The offense held its end of the bargain better than the pitching staff, but it was plagued by key injuries to David Ortiz and Jacoby Ellsbury while surrendering too many plate appearances to the Mike Avileses and Pedro Ciriacos of the world. From 1998 through 2011 the Red Sox never won fewer than 82 games. Following an all-too-brief, all-too-enjoyable respite from the cellar in 2013 (more on that later), the 2014 Red Sox again finished in last-place as the Orioles ran away with the divisional crown. Young players like Xander Bogaerts and Jackie Bradley Jr. were entrusted with starting roles and didn’t produce as expected (particularly Bradley), while the offense as a whole was uncharacteristically punchless – only David Ortiz (35), Mike Napoli (17), and Bogaerts (12) hit more than 10 home runs. The starting rotation, outside of Jon Lester and a league-averagish John Lackey (both dealt away at the deadline), was a disaster. Bad Clay Buchholz returned, and the back-end of the staff rotated four different pitchers with at least 10 starts and a strikeout-to-walk ratio under two. The silver lining, of course, is that the 2013 Red Sox won another World Series and this year’s team, by both PECOTA and FanGraphs, projects to finish atop the muddled AL East. One would hope that a trip to the basement doesn’t have to precede every winning season in a post-Theo world, especially for a franchise with Boston’s financial clout, but there are a number of ways in which recent Red Sox failures have helped set up future success. Teams that win every year have to deal with a delightful burden: they have to play every game to win. For the most part, that’s a good thing. You know, for obvious reasons. On the downside, it makes it difficult to incorporate young players into the major-league mix. Take the Yankees, who’ve only made one playoff appearance over the last three seasons, and missed October baseball in consecutive years in 2013 and 2014 for the first time since 1993. Despite the postseason whiffs, the Yankees have stayed in the hunt in both of those campaigns, failing to bow out of the race until season’s end. In part because of that, last year’s Yankees team, for example, only had one position player under 30 years old – Yangervis Solarte, who was traded in July for the older Chase Headley – rack up more than 200 plate appearances. In fact, New York hasn’t handed a significant amount of playing time to a position player under age-25 since Eduardo Nunez turned the trick in 2011, perhaps by using a fake date-of-birth that aged him five years. In each case, the Red Sox were able to glean valuable information about young talent, giving them a better foundation from which to make decisions heading into 2015. Middlebrooks, Bradley, and Bogaerts were expected to be major contributors right out of the gate last season, back when the Red Sox thought they were contenders. Between two more trips to the disabled list and an otherwise hackworthy repeat of past struggles when he was on the field, Boston finally decided to pull the plug on the Will Middlebrooks Project, dealing him to the trade-happy Padres this offseason for defense-oriented catcher Ryan Hanigan. Like Middlebrooks, Bradley Jr., despite all-world defense in centerfield, played his way out of the 2015 outfield picture with a cringe-worthy .198 TAv in a lengthy look last season after a lackluster debut in 2013. Bogaerts largely struggled as well, but at just 21 years old, there were enough positive strides to allow the Red Sox to stick with him essentially all season – and with a playoff berth unlikely by mid-summer, there was little reason to ship him off to Pawtucket in hopes of finding a short-term replacement. Fielding a last-place club in 2014 allowed the Sox to call up prospects later in the year for extended cameos. Perhaps more beneficial than sticking with young players mired in season-long slumps, fielding a last-place club in 2014 allowed the Sox to call up prospects later in the year for extended cameos. One of those players was minor league sensation Mookie Betts, who was hitting .346/.431/.529 between Double-A and Triple-A (at age-21) when Boston decided to make him its everyday center fielder in mid-August. 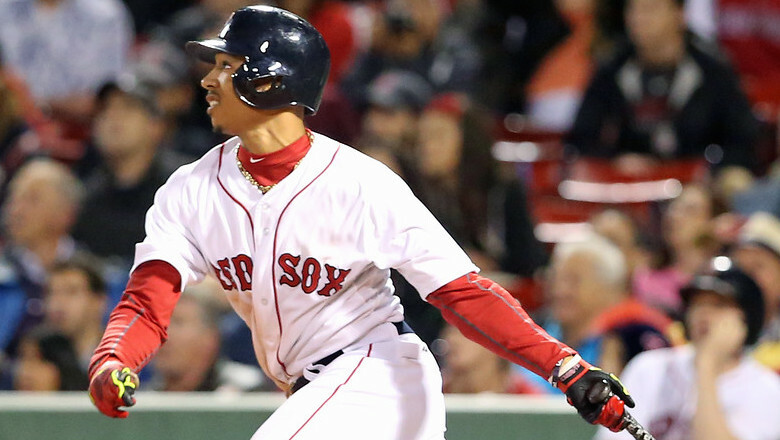 Betts rewarded the Red Sox by hitting .317 in September while showing the type of plate discipline that helped him climb the prospect ladder with a helium-fueled jetpack. Betts started 2015 as the everyday center fielder and, per PECOTA, is projected to be the best player on the team. The Red Sox also called up catcher Christian Vazquez on July 9th, a defensive specialist who lived up to his name in 50 starts behind the dish last season. Though Vazquez only OPSed .617 in 201 plate appearances, he displayed enough pitch-framing expertise (plus-32.3 framing runs/7,000) and control of the running game (52 percent caught stealing percentage) to make him the Sox’s Opening Day choice this spring until Tommy John surgery reared its ugly head. The 2014 pitching staff featured a similar trend: the quintet of Rubby De La Rosa (25), Brandon Workman (25), Felix Doubront (26), Allen Webster (24), and Anthony Ranaudo (24) received 61 combined starts, enough work for Boston to decide that its 2015 rotation, at least initially, wouldn’t include any of them. 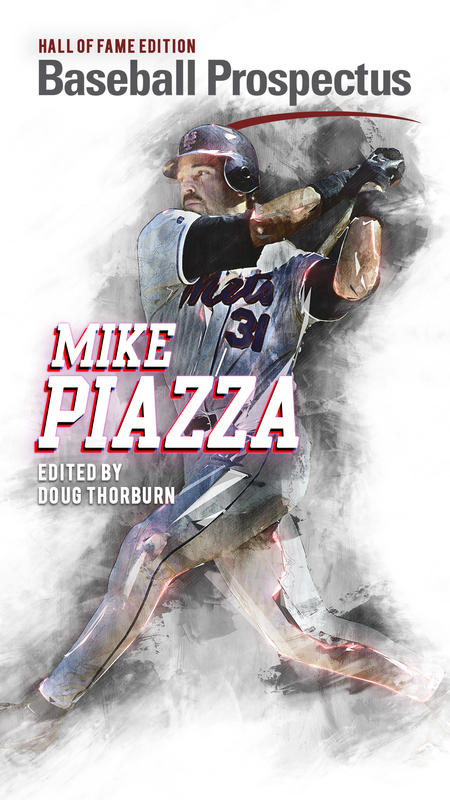 Scouting and stat-based projections give a team a solid idea of what a minor league player can provide once he reaches the majors, but there’s no replacement for evaluating that player in action against the game’s best competition. Whether it was Mookie Betts’ .388 on-base percentage or Anthony Ranaudo’s 8.8 strikeout percentage, last year the Red Sox were able to use Fenway Park as a test ground for prospects, a benefit that wouldn’t have been available had they been in the thick of a playoff hunt. In both 2012 and 2014, the Red Sox, not surprisingly, didn’t make a single (major) trade that was aimed at improving the current team’s status. 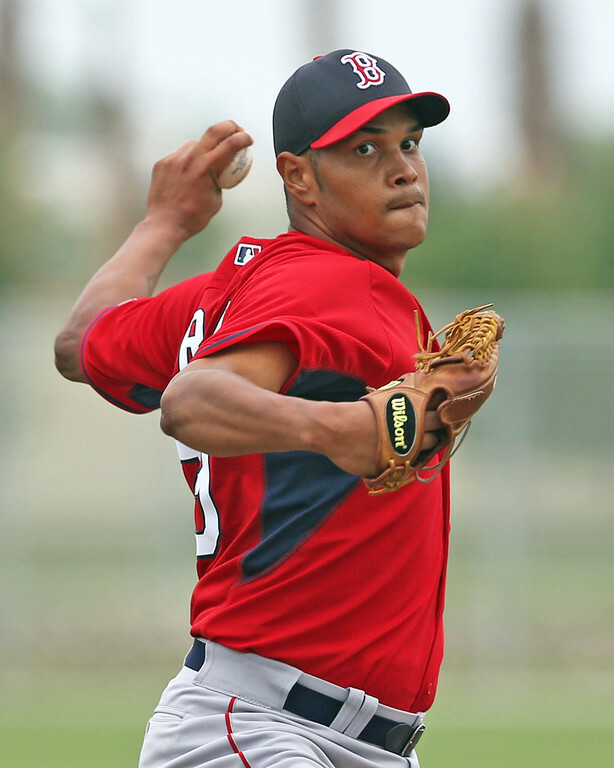 The Red Sox’s failures in 2014 led to them landing Eduardo Rodriguez. Last year, Boston made a number of deals that were focused on a quick 2015 turnaround. The Sox dealt Jon Lester and Jonny Gomes to the A’s for Yoenis Cespedes (who ultimately turned into Rick Porcello), ensuring they’d get something for Lester if a long-term free agent deal never materialized. John Lackey was dealt at the deadline (along with lefty Corey Littrell) for Allen Craig and Joe Kelley, two players who figure to make an impact on this year’s team. The Red Sox also made a number of deals that are typical of losing clubs, shipping out spare parts for prospects of various promise: Andrew Miller was sent to Baltimore for left-hander Eduardo Rodriguez (currently ranked fourth in the system), Felix Doubront was traded to the Cubs for a player to be named later (eventually infielder Marco Hernandez), and Jake Peavy was dealt to San Francisco for two pitchers named Edwin Escobar and Heath Hembree. If we harken back a little further, outside of a few small-scale moves, the 2012 Red Sox largely stood pat — that is, of course, until Ben Cherington and Co. executed a late-August blockbuster that sent Adrian Gonzalez, Carl Crawford, Josh Beckett, Nick Punto, and cash to the Dodgers in exchange for James Loney, Ivan Dejesus, Webster, Rubby De La Rosa, and Jerry Sands. That trade didn’t work out quite as well as planned, only because Webster, the top prospect brought over in the deal, disappointed in 18 starts in the majors before being shipped to Arizona with De La Rosa for Wade Miley this offseason. More than the disappointing return, though, the trade allowed the Red Sox to famously get back to their 2004 roots. They used their newfound financial freedom on short-term, value-oriented deals in the 2012-2013 offseason, adding the likes of Shane Victorino, Gomes, Napoli, and Koji Uehara, all of whom played large roles in Boston’s resurgent 2013 World Series run. Bryce Brentz, OF –Still in org. Sean Coyle, 2B – Still in org. Jose Vinicio, SS – Still in org. Jackie Bradley Jr., OF – Still in org. Brandon Workman, RHP – Still in org. Williams Jerez, OF – Still in org. Cody Kukuk, LHP – Still in org. The Red Sox have held on to 13 of the 20 prospects from a list made over three years ago. Sure, Boston swapped Jacobs for relief help during the 2013 season, but he was already on the downtrend and certainly hasn’t panned out. Most of the other players traded or released on this list – like Middlebrooks and Lavarnway — were sent packing only after Boston had seen enough to know they were no longer part of the long-term plan. In turn, the Sox have been able to stash players like Bogaerts, Swihart, Owens, Barnes, Ceccini, and Bradley Jr. away in the minors, patiently waiting as they develop into major-league contributors or premium trade bait. Range closer, to Baseball Prospectus’ 2014 Red Sox top 10, and you’ll find only one player – Webster – who has been dealt from that list. Thanks to two losing seasons in three years and a good dose of patience, the Red Sox have been able to hoard a collection of young talent that rivals any team outside of Chicago. Let’s start with the draft. The numbers here aren’t staggering at first glance, but consider this: when the Sox scored the seventh overall pick in the 2013 draft, it was their highest first-round selection since they took Trot Nixon at No. 7 in 1993. In fact, Boston had a recent stretch from 2004 through 2010 where it didn’t have a single pick inside the first-round’s top 20. Yes, the burdens of success — of course, the Red Sox did an excellent job developing home-grown talent in many of those years, a credit to their ability to draft and develop. Still, early draft picks are a good thing, especially when you forget about how you got them. The Red Sox picked Trey Ball seventh overall in 2013. They have the seventh overall pick again in 2015. 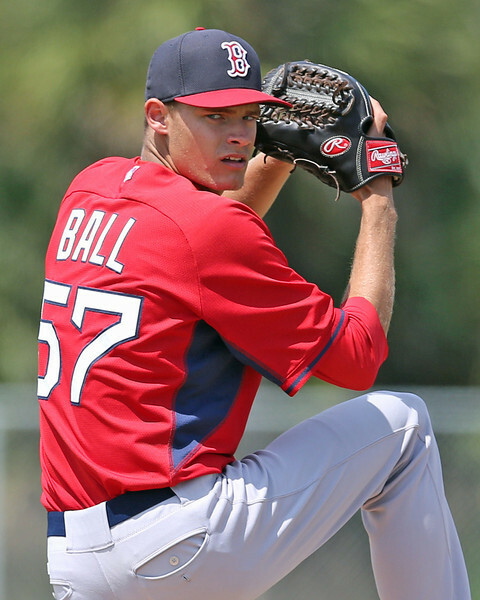 In 2013, the Red Sox signed both of their first two picks, left-handed pitcher Trey Ball and right-handed pitcher Teddy Stankiewicz, to below-slot deals. That, combined with a run of $10,000 college senior signings in rounds eight through 10, allowed the Red Sox plenty of flexibility at other points in the draft. 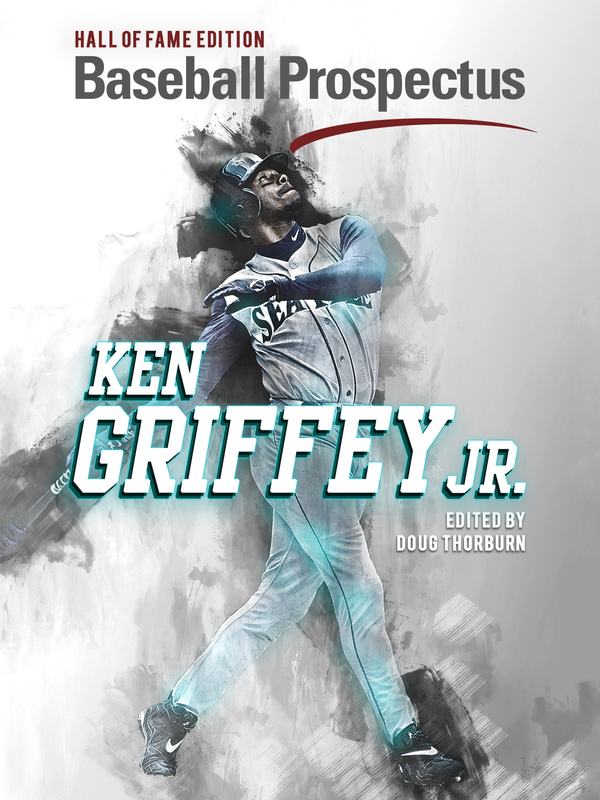 The Sox were able to lure highly coveted catcher Jon Denney away from an Arkansas commit with an above-slot third-round deal, and they were also able sign four players from rounds 11 through 40 to deals over $100,000, including a $440,000 splurge in the 30th-round on high school outfielder Nick Longhi. The results have been mixed – Ball’s dipped out of most Red Sox top 10s while Denney didn’t play at all in 2014 after a spring training arrest, but both Stankiewicz and Longhi made solid pro debuts. Regardless of the returns on a draft just two years old, thanks to their 69-win season in 2012, the Red Sox were able to take high-upside talent early in the draft while using their hefty signing bonus pool for later round flexibility. The Red Sox are again set to draft seventh in the 2015 draft, another positive side effect from last year’s 71-win campaign. And since the first 10 picks in the draft are protected, the Red Sox were able to sign both Pablo Sandoval and Hanley Ramirez while retaining their top overall selection. The Sox did have to surrender their next two picks as part of their offseason spending spree, leaving them without a second pick until the third-round (81st overall) and with a middle-of-the-pack $6.5 million signing bonus pool. The seventh overall pick gives Boston another chance to add premium talent early, even if injuries and a lack of star-power are taking their toll on the top of this year’s crop. There’s a possibility Boston takes a stab at working out a below-slot deal with a recent Tommy John casualty like Brady Aiken (last year’s first overall pick) or Duke’s Mike Matuella, again using saved first-round money to attract hard-to-sign talent later on. On the international amateur market, Boston also reaped the rewards of a $3 million-plus bonus pool during the 2013-2014 July 2 signing period. They nabbed third basemen Rafael Devers for $1.5 million, and he used a mature left-handed stroke to post a .910 OPS as a 17-year-old in two rookie league stops last season, soaring up Red Sox prospect lists and sneaking inside Baseball Prospectus’ top 101 in the process. Boston used every penny of its budget during the 2013-2014 signing period, which included three more six-figure signees: left-handed pitchers Emmanuel DeJesus ($787,500) and Jhonathan Diaz ($600,000), and outfielder Yoan Aybar ($450,000). In fact, the Red Sox actually spent nearly five percent over their bonus pool, a maneuver that cost them a 75 percent tax on the overage but no future spending restrictions. Early draft picks are a good thing, especially when you forget about how you got them. During the upcoming 2015-2016 July 2 signing period, the Red Sox again have one of the highest bonus pools in the league; this year, however, they probably won’t be able to spend all of it. Since they blew past their budget in the most recent J-2 signing period with a class led by Cuban sensation Yoan Moncada, Boston won’t be able to ink an international amateur for more than $300,000 for the next two signing periods. All isn’t lost, as the Red Sox can still spend as much of their pool as possible stockpiling $300,000-and-under international lottery tickets while trading away what’s left of the pool money. Spending restrictions have made it harder for big-market teams to flex their financial muscle in amateur markets (well, sort of), but the Red Sox have been able to infuse their organization with high-upside talent thanks in part to their on-field collapses in 2012 and 2014, an unforeseen circumstance that’s helped them construct a top-heavy and deep minor league pipeline. It’s dangerous to give the Red Sox too much credit — after all, in Cherington’s three years as general manager, the Sox have amassed an uninspiring .488 winning percentage with a yearly payroll that’s rivaled by only two or three teams. Where Cherington and Co. deserve praise is for their willingness to take their last-place medicine in stride, instead of throwing all their chips on the table in an all-out effort to win 80-odd games every season. For their patience, the Red Sox have been rewarded with a major-league roster full of young stars and capable veterans, a healthy farm system stocked with equals parts big-league ready talent and long-term projects, and the payroll flexibility to remain a threat for any free agent or contract extension candidate (see: Porcello, Rick). There’s a point where it all could have gone wrong, where the Red Sox could have panicked and sold off the future for post-prime short-term upgrades. There’s a point where the Red Sox could have turned into the Phillies, grasping to the winning days of yore with the wrong players. Instead, as the new-look roster played home run derby on Opening Day against a Phillies team desperately fighting off the last stages of a full-on rebuild, the Red Sox have quickly repositioned themselves as an American League power. Losing 90-plus games in two of the last three years wasn’t in Ben Cherington’s blueprint for long-term success, but the way he handled the Red Sox recent misfortunes might deserve a new chapter of its own. Dustin Palmateer is an author at BP Boston and the owner of a .185 division III junior college batting average. Great piece. One small quibble: the Red Sox traded Anthony Ranaudo to the Rangers during the offseason. Indeed he was. Thank you! Great catch; guess I totally missed that one. And thanks! The Red Seat: Episode 106-Spring Training Has Arrived! The Red Seat: Episode 100- The Red Sox are the 2018 World Series Champs! The Red Seat: Episode 98- The Red Sox are American League Champions!